One of the most exclusive and luxurious ways to travel across South Africa. There's nothing more romantic than racing across Africa on a classic train journey. Steeped in both history and luxury, South Africa's deluxe vintage trains will bring you breathtaking views, lavish sleeping carriages, decadent cuisine and a true taste of aristocratic travel at the turn of the century. They are atmospheric adventures into a bygone era and trips to treasure for a lifetime. The Blue Train is a true 5* experience through the heart of South Africa. Known as South Africa's ‘Blue Jewel' it is famed throughout the land for its superb accommodation, second-to-none service and jaw-dropping scenery. Stepping aboard the Blue Train, you'll enter a nostalgic, lavish world where nothing is too much to ask. Simply settle into a window seat and watch the splendour of the Rainbow Nation unfurl before your very eyes. It's magical stuff. Taking an overnight journey between Cape Town and Pretoria on the famous Blue Train is something unsurpassable. While the trip may last only one night, the memories will linger far, far longer. Kings and presidents have travelled in these esteemed carriages, filling each coach with decades of atmosphere and history. Today, the Blue Train is seen as the last word in luxury. It's an elegant, moving five-star hotel, with accommodation and service to match. Travelling aboard the Blue Train, you can choose between a Luxury or Deluxe Suite. Each suite is meticulously adorned with authentic African features and fitted with only the finest bed linen. You'll find cool marble tiles as well as gold fittings in the en-suite bathrooms. Every single suite is steeped in sheer opulence, ensuring that you'll be treated to a night to really remember. During the day, your suite will be converted into a comfortable lounge area. Then, as night draws in, your own personal butler will make up your bedroom and cater for anything else that you might need. It really is star service all the way aboard the Blue Train. 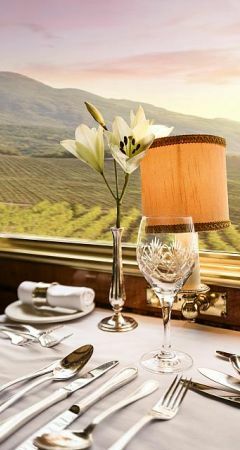 Evenings aboard the Blue Train are elegant and sophisticated affairs, with exquisite traditional menus conceived by top chefs, complemented perfectly by the very best of South African wines. As the hills, valleys, deserts and mountains of South Africa pass by your window, you'll be treated to a meal that will delight your tastebuds and to scenery that will knock your socks off. For daydreamers and romantics, the Rovos Rail is rich with vintage elegance and dripping with decadence. It's a wistful, nostalgic journey where indulgence is no-holds-barred and pure sophistication is guaranteed. The moment that you step aboard, you'll understand exactly why Rovos Rail has gained an international reputation for a truly top-notch experience on the tracks. Let Africa unfold before you and luxury unfold around you. The routes are even more breathtaking than the trains themselves, giving you a chance to glide gracefully from cosmopolitan Cape Town through the lush cane fields of Kwa-Zulu Natal or the beautiful desolation of Little Karoo desert. Real romantic adventurers can explore even further afield in Africa, travelling to the crashing wonder of Victoria Falls with a Big Five safari en-route, or passing between the towering sand dunes of Namibia. Capturing the spirit of a bygone era, these are some of life's truly incredible journeys. The classic wood-panelled coaches whick you back in time to an era of privileged, decadent rail travel. The gracious colonial-style railway station, Capital Park, just north of Pretoria, serves as an elegant departure and arrival platform for each trip, adding to the atmosphere reminiscent of the golden age of rail travel. Sleeping aboard the Rovos Rail is a sumptuous treat in itself, with first-class bed linen, perfectly plumped pillows and a full deck of creature comforts at your disposal. You can choose between twin or double-bedded Royal, Deluxe or Pullman suites. Each one of these is a stunning vision of vintage opulence, with mod cons blending seamlessly into the period Edwardian features. All of the suites include a bar fridge, and an en-suite bathroom with either a Victorian bath and separate shower, or simply a shower. During a journey aboard the Rovos Rail, you won't only sleep like a king - you'll eat like one too. The 3-course lunches and evening meals served on board are lovingly planned and meticulously prepared by a team of acclaimed chefs using fresh, local ingredients and traditional South Africa dishes for inspiration. Every course is elevated to the sublime by the addition of specially selected South Africa wines. In the mornings, you'll be treated to a cold breakfast buffet with hot dishes made to order.